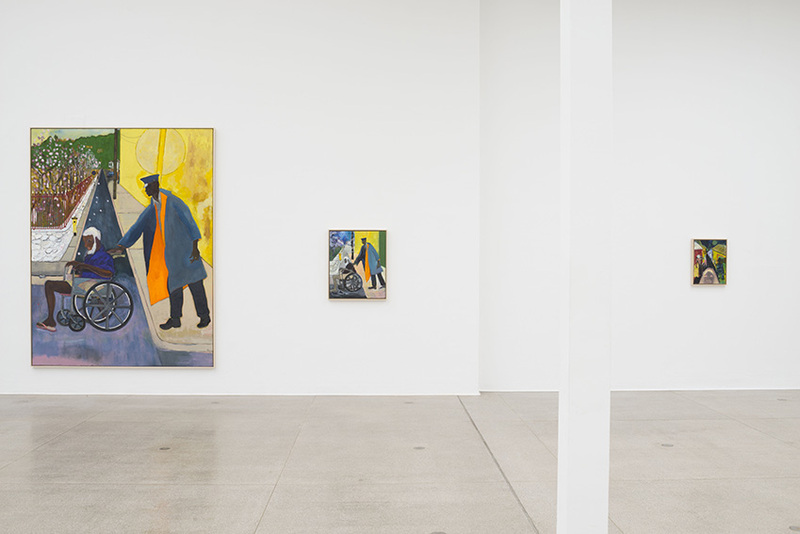 Peter Doig paints representational pictures as though they were abstractions. His spellbinding works combine planar forms and a palette that is as bold as it is subtle with vivid painterly gestures. His distinctive visual idiom interweaves personal recollections and found imagery with references to art history and pop culture in compositions that unfold into complex narratives. 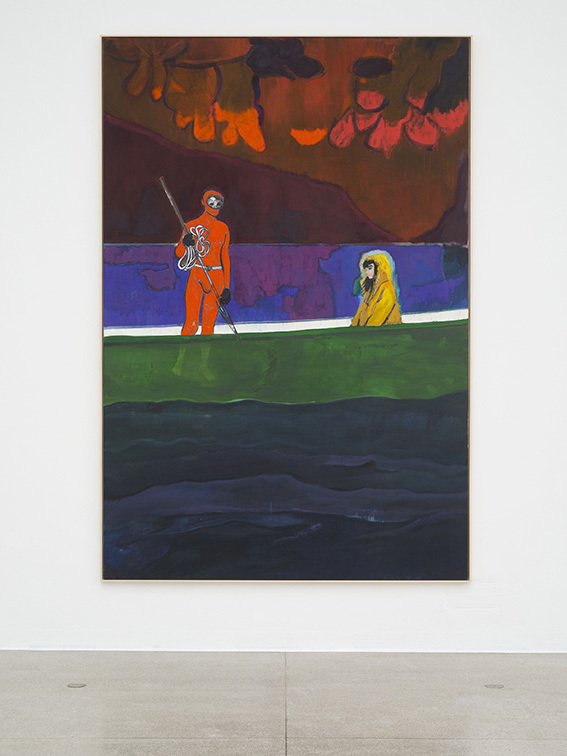 With the new paintings on view at the Secession, Doig continues to explore recurring motifs that have appeared throughout his recent work, drawing from the physical and cultural landscape that surrounds him in Trinidad, where these works were made. 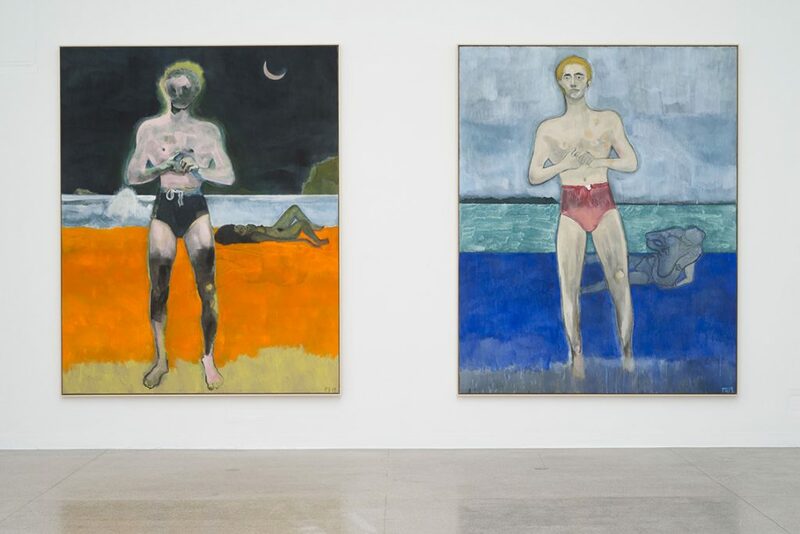 Doig returns to his 2017 homage to the American modernist painter, Marsden Hartley – a depiction of Robert Mitchum on a beach in Trinidad – but now Mitchum is nearly unrecognizable, an abstraction that allows Doig to experiment in paint handling and image-making. 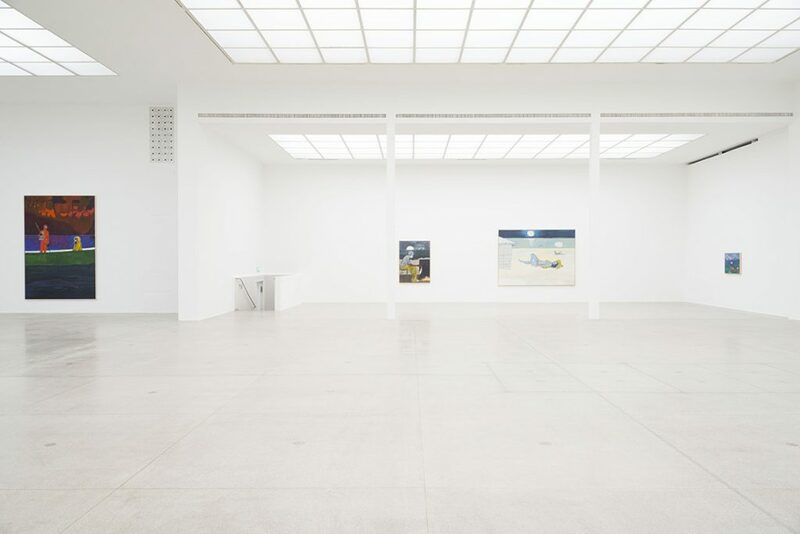 Organized as horizontal striations, the manifold color fields not only evoke a range of ambiances between day and night, they also draw attention to the means of painting. 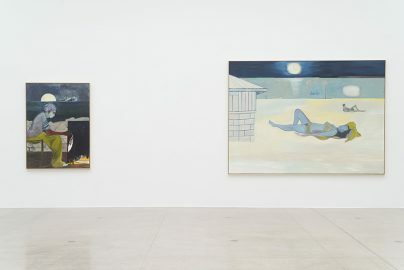 Doig is less interested in rendering identifiable, real scenes than in the interplay of representational and compositional elements that, weaving between reality and imagination, meld different planes of perception and recollection. 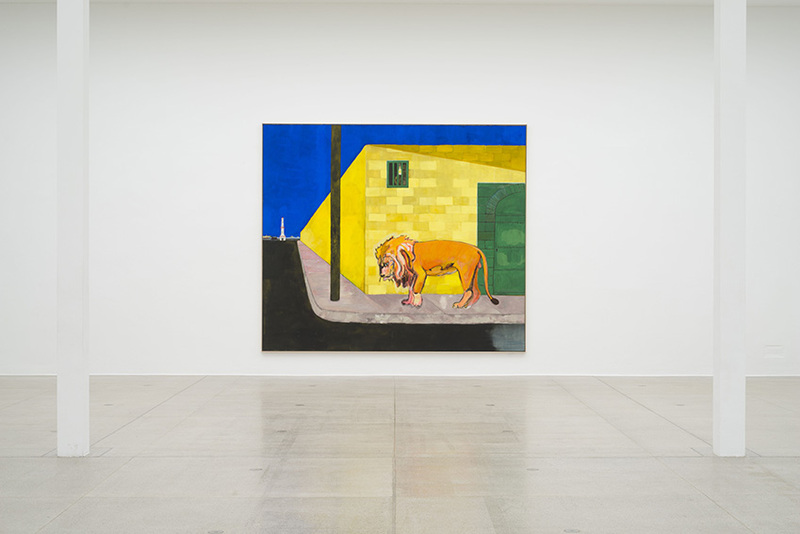 One of the most distinctive recurring subjects in Doig’s oeuvre is the prowling lion. In Rastafarianism, the biblical lion of Judah is a symbol of defiance and belief in the certainty of salvation. 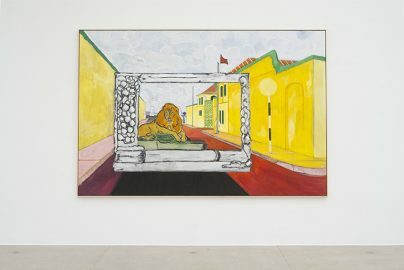 Images of which appear in great frequency in Trinidad and the Caribbean at large, where the lion (of Judah) has transcended into the realm of pop imagery. In Doig’s paintings, the lion can be seen promenading before yellow walls that not only allude to works by Giorgio de Chirico and Vincent van Gogh’s The Yellow House, but also represent the notorious yellow-walled prison on Port of Spain’s Frederick Street. By returning to and reworking motifs from earlier compositions, Doig continually challenges himself to forge new territory in his pursuit of image-making. 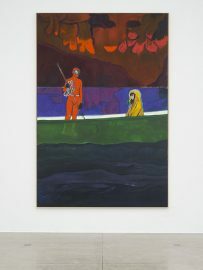 In other paintings, Doig renders the cacophony of downtown Port of Spain’s streetscapes, and cameos are made by late, legendary calypsonian, The Mighty Shadow. A man paints by moonlight within walls of the prison Carrera, set on the island by the same name that has appeared in a number of Doig’s works. Elsewhere, a balcony looks out onto a clouded forest and the scenic bays and dense bush that surround Doig’s home. Beyond, vistas of the hillside town of Paramin on the north coast of Trinidad can be made out. The dark night opens onto the vast, unobstructed sea. Friends, neighbors, loved ones, and strangers make appearances in Doig’s pictures, animating landscapes and moody seascapes where his personal biography intertwines with the lives of others, lead and observed nearby. 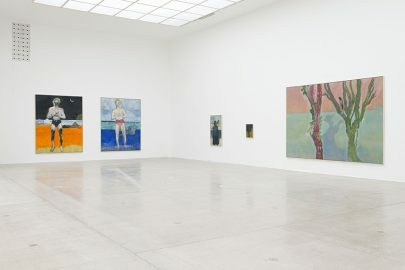 Peter Doig is one of the most influential painters working today and this exhibition is his first solo show in Austria. 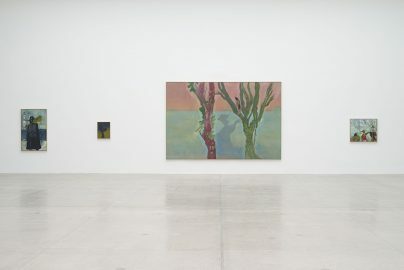 Doig was born in Edinburgh in 1959 and grew up in Trinidad and Canada before moving to London in 1979 to study painting. He currently lives and works in New York and Trinidad. 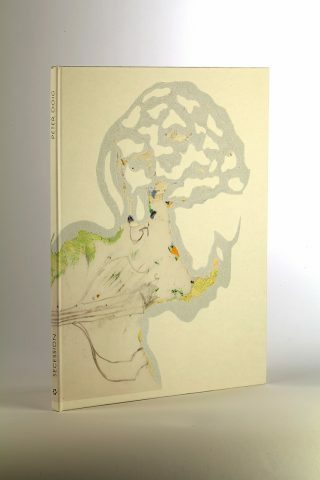 Drawings, sketches, stencils, collages—the works reproduced in this artist’s book offer a glimpse into Peter Doig’s process. While composing his paintings, thoughts and ideas are assembled through a myriad of preparatory materials; compositions are configured and reconfigured. With the work on view at the Secession, Doig continues to explore recurring motifs in his recent work: bathers, lions, and music, all with nods to the social and cultural landscape that surrounds him in Trinidad. Doig’s paintings are never premeditated, and in the process of making he often works with the notion of resolution. The journey from nascent idea to completed work of art is one that haunts and perplexes.